Poor visibility puts your projects at risk and increases anxiety among your team. 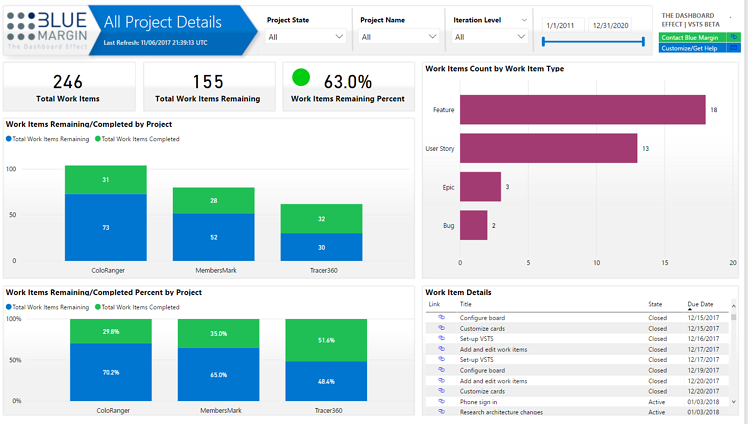 The VSTS Solution Template automates dashboards that identify when resources are overloaded, where bottlenecks are hindering progress, and what risks are increasing. All in near real-time. What's my progress by project and across the portfolio? What is my distribution of Work Items by resource, project, and task stage? What percent of my Work Items are bugs, epics, features, issues, tasks, or case studies? What is the ratio of my Work Items by stage (Closed, Open, Resolved, etc.)? 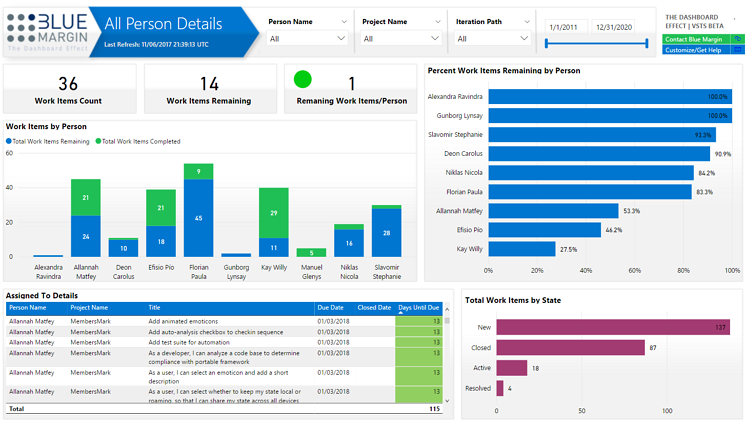 Which Work Items are outstanding, by employee, project, and date? 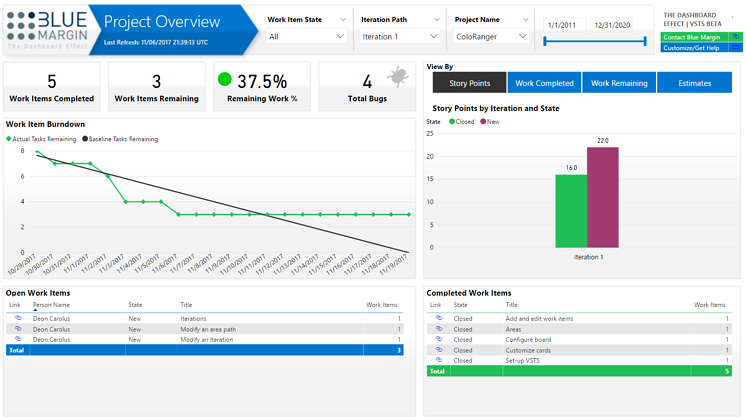 View Key Performance Metrics by story points, work complete, work remaining, and estimates. Quickly identify Work Items that are past due, the resources assigned to them, and the projects in danger of falling behind. Dig into project bugs and figure out in what stages they predominantly appear, their severity, and who is responsible for resolving them. Development should be intentional and methodical, not reactive and frenetic. 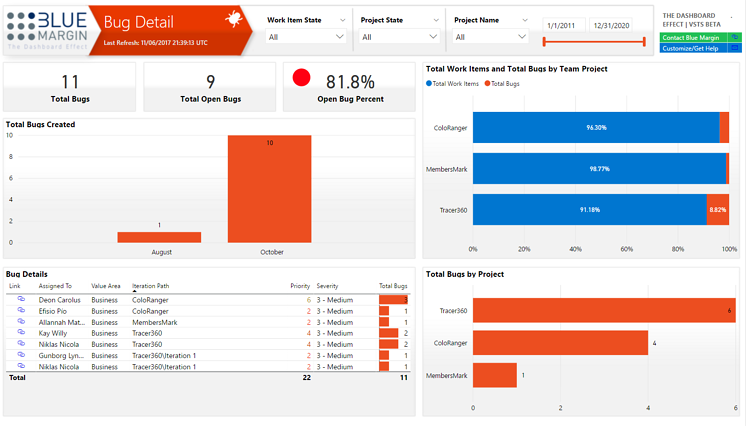 While VSTS helps you capture your project data and coordinate tasks and resources, Blue Margin’s VSTS Solution Template completes the picture by automatically-updating and pushing-out dashboards that highlight issues and opportunities on an exceptions basis. Blue Margin is releasing a free beta-version of the VSTS Solution Template. Download it, connect it to your VSTS instance, and immediately see your data come to life. Submit your feedback to vsts@bluemargin.com to provide insight into how the solution template is working for you. If you are interested in customization options, reach out to jon.thompson@bluemargin.com.